1. Heat oven to 350°F (or 325°F for dark or nonstick pans). Grease bottoms and sides of 2 (8- or 9-inch) round cake pans with shortening or cooking spray. Make cake mix as directed on box, using water, oil and eggs. Pour into pans. 2. Bake as directed on box for 8- or 9-inch rounds. Cool 10 minutes; remove from pans to cooling racks. Cool completely, about 1 hour. 3. Spread frosting over side and top of each cake. For hat on each cake, press graduated lengths of broken pretzel rods across top third of cake, with 2 pretzel rods extending 1/2 inch beyond side of cake to form brim of hat. For eyes, press 2 black gumdrops on each cake. 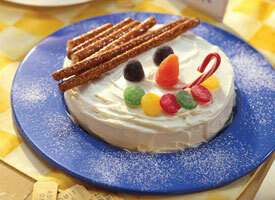 For nose on each cake, press 2 orange gumdrops to flatten; shape to make pointed nose and press on cake. For mouth on each cake, press 5 gumdrops to flatten; cut into rounds. Press and overlap flattened gumdrops on cake. For pipe on each cake, poke straight end of candy cane in cake slightly above mouth. Heat oven to 350°F (or 325°F for dark or nonstick pans). Grease bottoms and sides of 2 (8- or 9-inch) round cake pans with shortening or cooking spray. Make cake mix as directed on box, using water, oil and eggs. Pour into pans.